Conor Mark Jameson completes the Cheerps blog trilogy. First thing in the morning I confronted the task of working out how to get Cheerps back in his rightful place. I got the ladder out and climbed up alongside the nest hole. From the side, I could see a sibling sparrow’s head poking out, yelling encouragement at no doubt frazzled parents. The head turned unsteadily on a scrawny neck, got me in focus, fell silent, and slowly – comically – retracted. Looking from the front of the crevice I could see it, as though at a port-hole, like a Gary Larsson cartoon figure, peering, wide mouth now firmly shut, head still wobbling. To my intense relief I was able ease a slate up and gently return Cheerps to the straw bundle, sending the other occupants scuttling to the back of the box, hidden among straw and chicken feathers. We know from research that late broods of sparrows are not very productive. By July the birds often struggle to find enough to eat. It certainly struck me, watching the parents come and go at the nest hole, how infrequently they visited, and how little they appeared to bring, especially compared to how much my foster sparrow has been able to pack away while under my supervision. 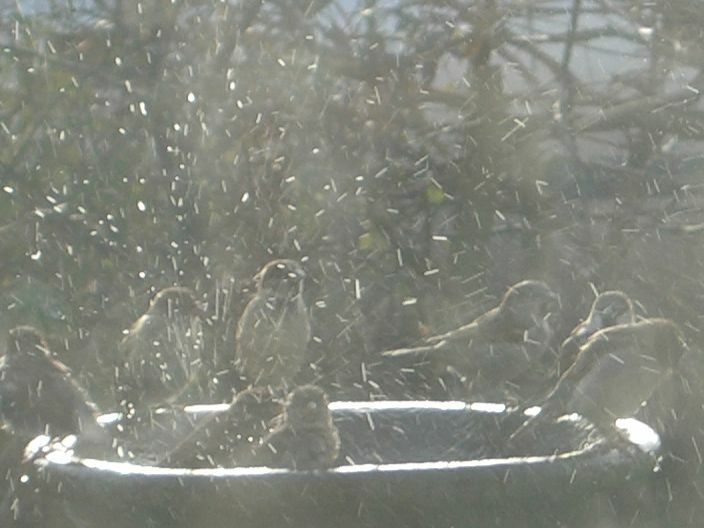 I’m hopeful I will still have my unruly band of local sparrows visiting for birdseed and crumbs through the winter. Maybe Cheerps will be one of their number. One thing I can be sure of, however, now that I’ve secured the nest site on the loft-side, is that there won’t be any more like him falling into the house next summer. All being well, future sparrow feeding duties will be a little less ‘hands-on’. Tweet your questions tohttps://twitter.com/#!/BB_Specialistfor the interview with Conor on Monday at 12.
i’ve had him for 4 days now and what everybody said would be a waste of time has become my labour of love. i’m really proud of us, Coco and myself that is….. we’ve done it against all the odds! afterall, what did i know about raising a nestling!!!! anyway, now i need somebody to confirm he’s a sparrow and give me some advice about the next steps.